The Teknetics T2 is a multipurpose metal detector with an outstanding record as a top choice for gold prospecting, coin, and relics hunting thanks to its immense sensitivity and depth. Many prospectors in the USA haven’t even heard of this detector, but surprisingly it is one of the most popular gold detectors worldwide at the moment. It is particularly popular with gold prospectors in Africa right now, as a good quality and affordable detector that has proven itself quite well in the goldfields. The Teknetics T2 is designed and manufactured by First Texas Inc., a company with a long track record of quality metal detectors. It packs an impressive feature list which makes it an attractive option for all detectorists. The Teknetics T2 feels very light and firm in the grip of the user, and it comes in different colors with a control panel that has a large LCD screen occupying a sizeable portion of the panel. The LCD screen is unique displaying all the menus from the main menu to the menu the user is on. The shaft looks strong enough to withstand any stress, and the armrest feels comfy. The Teknetics T2 uses 4 AA batteries which could keep the metal detector running for approximately 12 hours. The LCD screen lets the user know what level the battery is at by providing a visual representation of the battery. The Teknetics T2 has its unique search coil; an 11” elliptical biaxial search coil. It is waterproof, which is perfect for hunting in creeks or in inclement weather. The search coil has the depth required in picking up even small gold nuggets during the treasure hunting in the field. If the gold prospector is using the pinpoint mode, the search coil wouldn’t be in motion, but it would still pick up gold nuggets irrespective of the depth. The coil provides good depth needed in highly mineralized grounds. The Teknetics T2 is certainly a capable detector for coins, relics and jewelry, but it is particularly well suited for gold prospecting. The ground cancellation feature allows the detector the cancel out the signals from the ground minerals the miner is prospecting while leaving those from the buried metal object untouched. This makes the T2 very functional even in very iron-rich soils. All the gold prospector has to do is manually adjust the settings on the Teknetics T2 to fit those of the conditions of the soil that you are hunting in. The Teknetics T2 has an operating frequency of 13 kHz which provides the sensitivity needed to find gold nuggets, but it will miss smaller gold that detectors like the Fisher Gold Bug 2 or Makro Gold Racer would be able to detect due to their higher frequency. However, the advantage is that it does a better job of canceling out ground noises and generally operates with a smoother threshold. For ground cancellation, the Teknetics T2 uses a feature called the Fastgrab for automatic ground cancellation and a conventional manual form of ground cancellation. The Fastgrab can be turned on using a trigger switch under the control panel. By pushing the trigger forward, the fastgrab feature is turned on. When the fastgrab feature is turned on the metal detector’s system calculates the magnetic properties of the ground and canceling out the interference generated by the naturally occurring minerals in the ground. Information produced by the system of the metal detector provides a baseline for the workings of the detectors in the different search mode. The Teknetics T2 has two search modes which help the user in his quest for gold namely the All Metal Mode and the Discrimination Mode. The preferred operating mode will depend on the amount of iron rubbish present in your prospecting location. 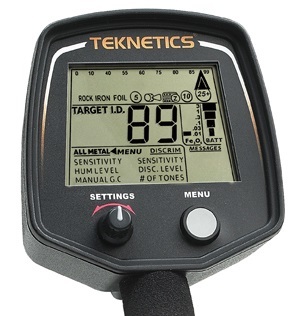 The Teknetics T2 is an exceptional metal detector and very budget friendly. As previously mentioned, this is one of the preferred metal detectors in the goldfields of Africa right now. It can be set up to operation quite smoothly in most situations. home | About Us | Privacy & Shop Policy | Site Map | View CartCopyright © 2018 Gold Rush Nuggets All Rights Reserved. The content of this website may not be used without written permission from Gold Rush Nuggets.